Que(e)ry began in 2010 as a subgroup of The Desk Set, an informal group of librarians, archivists, library science students and other individuals who love books and occasionally throw fund-raising parties for non-profit organizations whose missions support literacy and culture. Read more about The Desk Set in The New York Times and The New York Sun. Que(e)ry was developed by Desk Set members as a safe space for everyone; Que(e)ry aims to promote awareness for non-profit organizations that have established libraries and archives that advocate for gay, lesbian, bisexual, transgender, intersex, queer and two spirit (GLBTIQTS) rights and heritage. Que(e)ry has held 2 successful parties to benefit organizations like the LGBT Center, the Lesbian Herstory Archives, the Tom of Finland Foundation, and the Leather Archives and Museum. What can you expect at this event? Well, all manner and variety of things queer including (but undoubtedly not limited to): queer DJs, queer raffle prizes, queer literary-themed drinks and, most intriguingly, “nerdy go-go dancers”. The suggested price of admission is $5.00 – $10.00. Check it out! 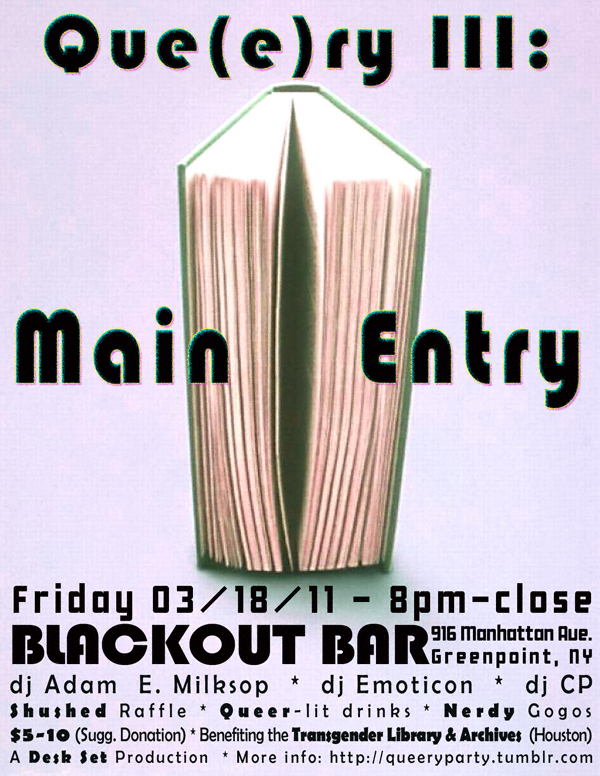 March 18, 2011 starting at 8:00 p.m.